Wafubeh! Thanks for visiting Warlock Asylum International News, your online resource for the latest in art, music, and politics from a shamanic perspective. If this is your first time visiting the site, we suggest that you use this opportunity to review some of our previous articles and share your insights by posting a comment. Wishing you all the best in your earthly endeavors. Have a great day! Iyaba Ibo Mandingo paints the perfect mirror for America to look into. Artist, musician, painter, and poet, Iyaba Ibo Mandingo is a self-made man. After following his work for nearly two decades, it’s beautiful to see the fruitage of the African lotus that he has spent so long in cultivating, finally come to bloom. While many spoken word artists have been criticized in the past for trying to sell you an idea, this Antigua-native Renaissance man comes to the stage with an original style and life experiences that serve as signature pieces. You certainly have to respect Iyaba Ibo Mandingo for signing his name on the dotted line of an honest approach for all that he has said and done in order to come to terms with who he is today. 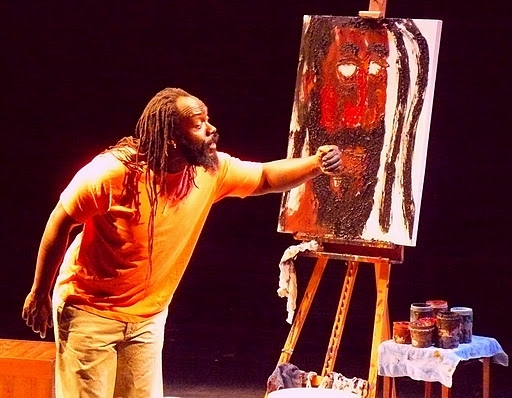 Recently, I had the opportunity to see Mandingo paint a perfect portrait of himself in his one-man performance, entitled, unFramed at the Harlem Arts Festival. The play invites us into the studio and life of Iyabo Ibo Mandingo, where he poetically describes his journey while paining a portrait of what is on his mind. It is within this dimension that we discover the joys he had as a child, how his family migrated into the United States from the Caribbean, and some of the many injustices and misfortunes he had to face as a man of African descent, and as a man struggling to be himself. Shortly after 9/11, Iyaba was arrested by the FBI and processed for deportation under the Patriot Act for performing a poem critical of America’s history, a topic covered in the play. The poem was not performed until the era of his remarkable work unFramed. There is something in unFramed for everyone, mainly because it is a brilliant way of presenting the “unTelevised revolution” of the struggle accepting ourselves for who we really are. Bravo!!! I’m giving unFramed – Five out of Five Stars. This is one that you dont want to miss! Wow, I like his artwork and the idea behind it! He sure is an inspirational person, such a great energy about him I must say.